The Colorado Trail is a beautiful but brutal mistress. It does not believe in switchbacks, instead preferring to charge directly up calf-quaking inclines before immediately plunging into toe-bruising descents. Lofty passes and plateaus summon the angriest of hail storms while gullies and canyons swelter with mud and moisture. So if you’re the masochistic type, you’ll have a really excellent time out there. Battling 230 miles of the trail last summer, I emerged with myriad aches and pains and a distinctly Frankenstein-esque gait. My pal Ricardo suggested I cap off the trip “in the most Colorado way possible” by getting a CBD-infused massage. Realizing that my aching musculature could serve as a map for every mile of the Colorado Trail, I made an appointment that day. I wasn’t high, of course. This was just the result of the ingredients performing their beautiful anti-inflammatory chorus. While I marinated in the absence of pain, the masseuse bravely continued with my ravaged feet and overworked legs, using a combination of Swedish, sports and deep tissue techniques. I twitched at certain pressure points, but eventually fell completely under the glorious CBD spell. By the time I flipped over, I was nearly catatonic, a dopey grin pasted on my blissed-out face. Stumbling back into the sunlight, I loped around in a state of ultimate relaxation. Back at my friends’ house, I gushed about the experience, feeling like a tall pile of cotton candy, a sweet weightlessness suffused throughout my once-weary bones. While the experience was transcendent, its true magic wasn’t revealed until the next day. 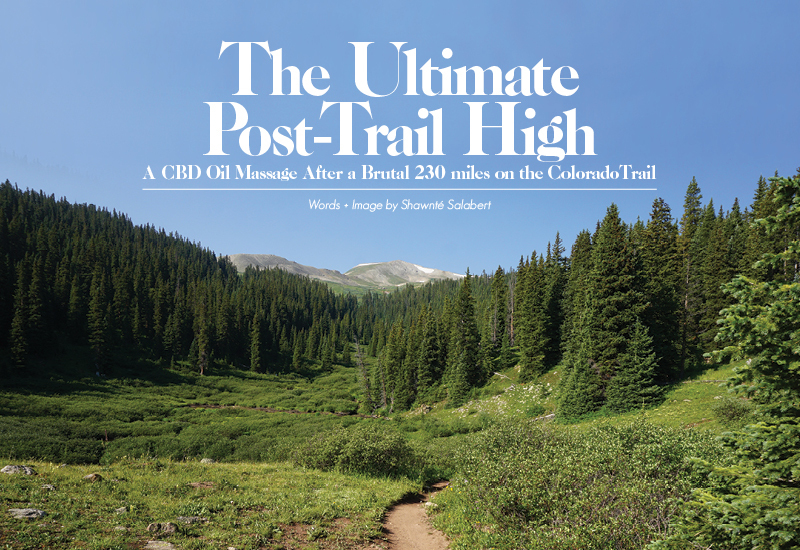 I could no longer map the trail via my aches and pains, still subdued by the CBD infusion. Instead, I could focus on the way the trail lingered in my heart and soul, which is, of course, the ultimate high.